It has been a pretty slow process watching the Android Lollipop update roll out, and the Sony Xperia Z is a device that has waited longer than many others such as the Xperia Z1, Z2 and Z3. The upgrade to the operating system finally started to roll out for this phone as well as the Xperia ZR last week. If you want to know what to expect you might like to check out a Sony Xperia Z Android Lollipop update review that we’re showing today. Last week we reported that the Android 5.0.2 Lollipop OTA (over-the-air) update was releasing for the Sony Xperia Z in various regions. The update is approximately 700MB in size and brings the original Xperia Z flagship to build 10.6.A.O.454. Usually these updates can take varying times to arrive for devices in different markets, but the fact that it is already arriving for some indicates that it will be heading to further regions soon. Below this article we’ve embedded a YouTube video from Adrienisen that shows a concise review of the Sony Xperia Z running the official Android 5.0.2 Lollipop update. It gives an overview of the new UI that Lollipop brings for this older Xperia handset, and begins with the reviewer opening up some apps and then going on to show some of the changes. Various aspects shown are the ‘Close All’ option, the new notification area with Quick Toggles, and the lockscreen. The review continues by showing further looks at the new software experience such as Settings, personalization options and themes, the Google Play Store, and also the Camera. On a couple of occasions the reviewer notes that the device slows down a little, but overall the UI receives positive comments. 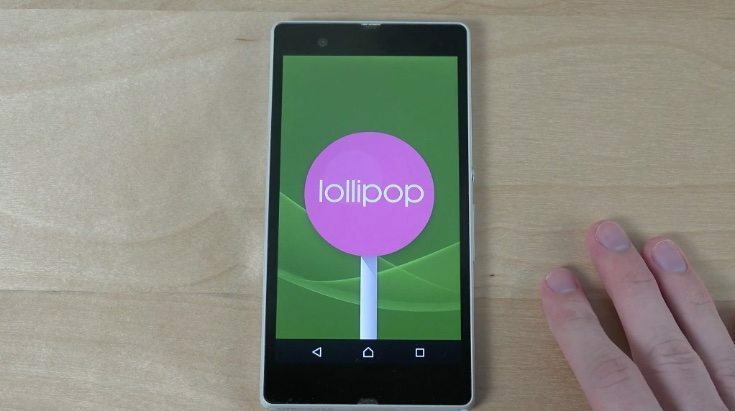 The review gives a nice taster of Lollipop on the Sony Xperia Z, so do take a look at the video below. If you haven’t already downloaded this update to your Xperia Z you might be interested in a review of Lollipop on the Xperia Z1 that we shared in April. We have received numerous comments in response to that article from owners of the Z1 complaining about various problems with their device since updating to Android Lollipop. It’s not clear how widespread these issues are or if they are also affecting other devices, so that might be worth bearing in mind before you update your Sony Xperia Z. If you have already received the Lollipop upgrade for your Xperia Z is everything running smoothly for you or have you noticed any problems? Maybe you’re still waiting for this Android 5.0.2 Lollipop update for the Sony Xperia Z and are now wondering if you should install it when becomes available? Do let us know by sending your comments. till now I didnt get any lollipop update on my sony xperia Z1! And have no answer why I didn’t yet. Not via my phone device neither via the PC Sony software! Is there an answer here?! Check with xperifirm. I d-loaded LP for my Xz from there and flashed it. 1.19 GB in size. Works perfectly. Maybe a bit slow charging but that’s no big deal. xperia z c6602 lollipop update always late in india ? ota notification & pc companion not show my phone ? sony india update very slow . Malaysia still dont get it..
My phone has been acting up since I did the update. Apps keep crashing and it’s slower and for some reason my phone refuses to charge properly!! I updated my Xperia z yesterday. All apps that I use working good. For a few hours of use I do not saw problems. I again have possibility to write and delete on SD card. For me Xperia z working better with Lolipop.